we were going for cannot be supported by this machine - largely because of some basics in testing the Web UI. Because of this, I ll be sending it back. I am not normally inclined to review anything. However we bought this for an office of 8 people. The goal was to walk up to it and scan to your own files. I was very nervous of the expense versus what looks like too lightweight a construction. We have been running it for 18 months now and I am impressed that it has lived up to the best of my expectations. It is robust enough. It scans well and at speed. It distributes across the network. Fantastic bit of kit. Just wish it were half the price. We found this scanner to be excellent. Easy to set up and use, we are finding it to be perfect for our needs in sending scans directly by email. Definitely a 5 out of 5. The canon scan front is fantastic, have found it very easy to use and it is the perfect size for my desk. The scanner is a perfect and great tool for coorodination between both my offices. It is very simple to use too, thanks for recommending this product to me! The large colour touch screen on the ScanFront 220 and ScanFront 220P network document scanners makes it easy for everyone to scan to email, ftp, folders and USB. Scanning and sharing information with your colleagues couldn't be simpler. Canon's new ScanFront 220/220P colour network document scanners redefine ease-of-operation thanks to a huge colour touch screen and instant network access - without additional hardware or software. 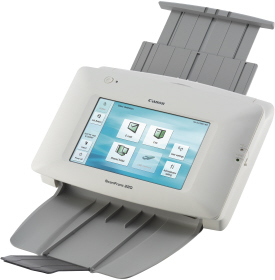 The ScanFront 220/220P makes scanning and distributing information easy. Simply place your document in the feed tray for scanning and choose the relevant icon to determine where you want to send it: an email address, ftp address, network folder or USB memory stick. It's so easy to operate, you can use it anywhere in the office: marketing department, sales group, finance department, or admin and logistic teams. The ScanFront 220/220P is deceptively small and fits comfortably on the corner of a desk. Fold away the document trays and it's smaller still. There's no need for hardware or software - the ScanFront 220/220P simply plugs directly into your network. A bright and sharp 8.5" colour touch screen is designed to make everything effortless. Before sending you can browse, rotate and zoom scanned images in detail to ensure the perfect results every time. Job buttons can also be setup to perform regularly undertaken scanning tasks at a single button-touch. Top scanning speeds of 26 pages per minute (at 150 dpi) in black and white/greyscale and 16 pages per minute in colour ensures maximum productivity. Doubled sided speeds are 52 and 16 images per minute respectively. For the highest quality, the optimum resolution of 600 dpi can be used. Advanced features such as Automatic size detection, Bleed through and background noise elimination, automatic deskew, Skip Blank page and OCR functionality, ensures maximum productivity. And reliable feeding technology -including advanced doubled-feed detection* - means anything from A4 documents to 300 gsm embossed business cards can be confidently handled. It's simple to configure the ScanFront 220/220P so that users must enter a name and password before scanning and sending a document. Alternatively, a Fingerprint Authentication system can be used*. Specific functions can also be made off limits to certain users and PDFs can be encrypted before sending - retrievable only with the relevant password.